Hello and welcome back to the blog for another day of Happy Camper inspiration. 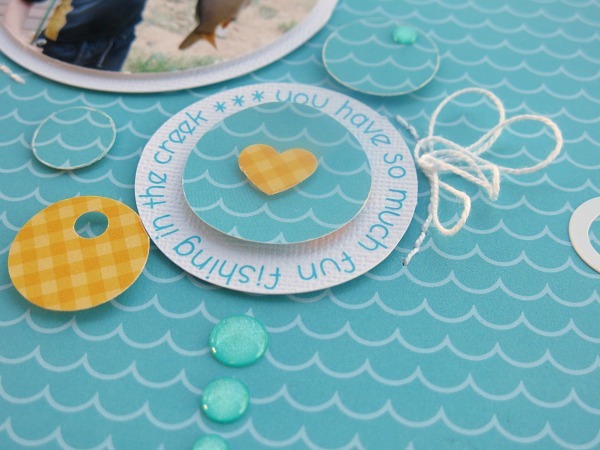 It's Melinda with you today and I finally get to share a layout featuring my 'middle child'. I find it quite easy to scrap my teenage daughter and toddler son but my Master 8 is just a little bit more difficult. Through no fault of his own mind you... it's all to do with me and my ability or lack thereof for creating fun layouts that suit him. 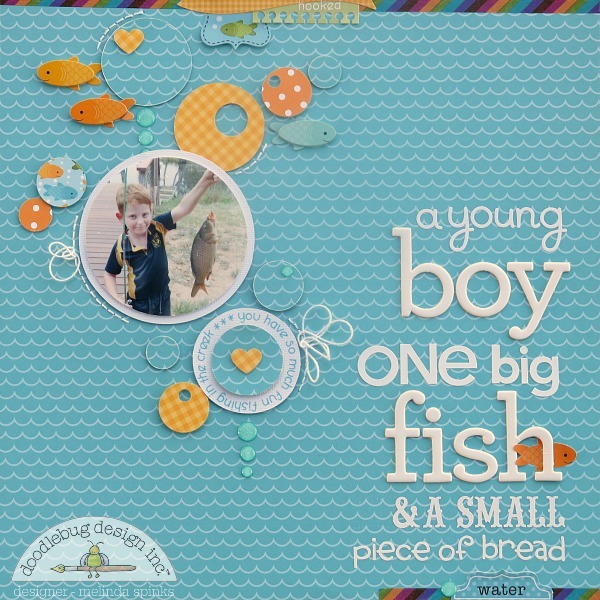 He is such a farm boy and there are very few tractors and trucks that make their way onto scrapbooking papers so I was delighted to see Happy Camper with lots of bits & pieces for boys... especially the fish! I decided to cut circles to emulate water bubbles created by fish so used various sizes and patterns including my photo and layered then down the page. I've been on a hand-stitching frenzy lately so added a small areas of stitching along the sides of a few main circles to add that extra bit of texture and interest. Oooo, I have a new favourite product - the Sprinkles now have sparkle and although it was hard to photograph so you could see just how glittery they are... believe me they are super cute! And finally I can say I have used the new 'chippers' alphas. These bad boys are fabulous for adding major punch to a heading because they are larger than the standard alphas and made from chipboard with a gloss finish. Perfect for high impact! So who has a whole pile of holiday photos from recent or even not so recent camping, boating or fishing trips that are tucked away and in need of some attention? Happy Camper has versatility to accommodate just about any theme of outdoor activity with a environmentally friendly colour palette. Thanks for stopping by today and don't forget to enter the give-away so you can be in the running for one of six Happy Camper prize packs. FUN & FABULOUS layout Melinda!!! 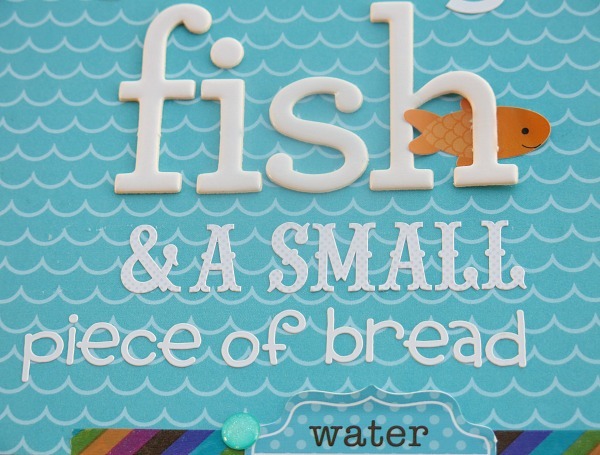 THANK YOU for sharing your CREATIVE INSPIRATION and reminding me of a "fishy" adventure growing up on the farm ... we used to fish in the main irrigation channel along the boundary of our farm and enjoyed tasty redfins. One day my baby brother brought back his catch of the day, 3 huge yellow belly. He did not lie when he said he caught them - our neighbour had been out fishing and threw them to him :) THANK YOU for the memories!!! thats quite a catch! 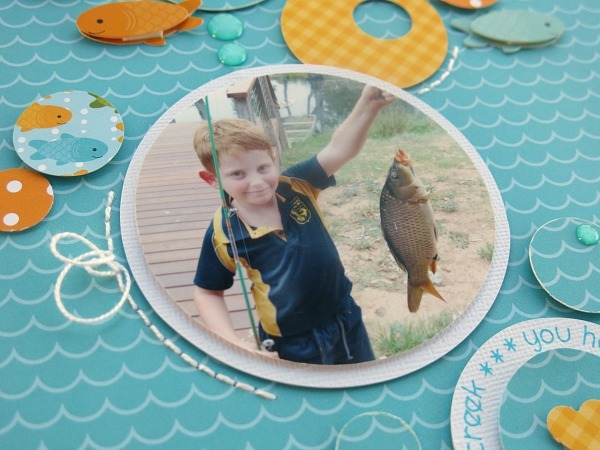 My DS loves fishing and I have so many photos of him fishing. The Happy Camper Collection would be perfect! Very cute! I like all the paper bubbles! What an adorable layout! I love that the photo looks like it's underwater. These layouts are just awesome! I shared on Facebook! Beautiful and sweet layout! I love the alpha stickers and the bubbles Everything perfect! I share this post on FaceBook! 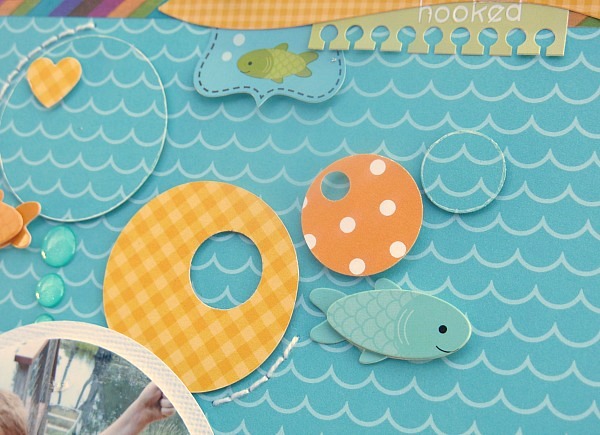 I pinned this beautiful layout to my Scrapbook Pages and Layouts board on Pinterest! Melinda always rocks!!! Shared this on facebook!!! I am a follower on Instagram as TaunyaButler! !